Delicious food is always a welcome present and what could be nicer than a gift basket containing delicious things specially chosen for the recipient rather than an off-the-shelf selection. There is a minimum purchase of £10 of goods to put into a gift basket and we would recommend the small basket for up to 6 or 7 small items, the medium basket for 8 to 12 items (particularly if they include a large bottle), and the large basket for more than this. If all of the items ordered don't fit into the basket chosen then we will pack them separately in your parcel. Please remember that is isn't possible to have more than one gift basket in a single order as they can't be combined in a single parcel. 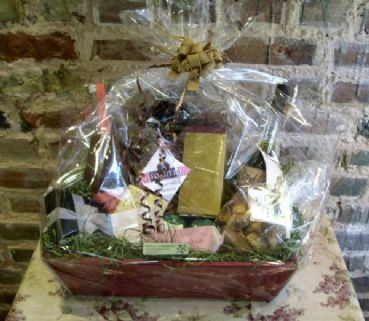 If you would like to purchase more than one gift basket please place a separate order for each.